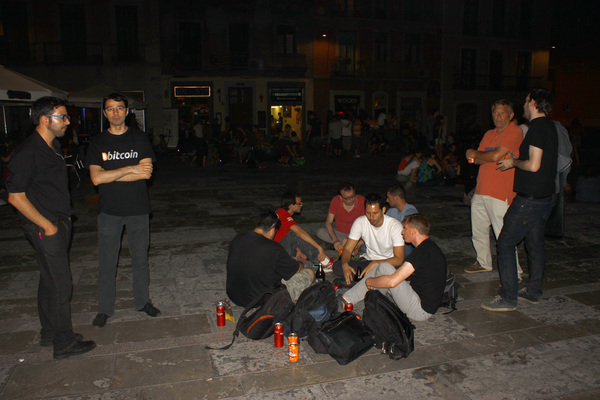 On a hot summer night in the Plaza del Sol in Gracia (Barcelona), close before the summer break, Bitcoin-entrepreneurs, -developers and -enthusiasts extended the international Barcelona Bitcoin Community MeetUp to discuss or prepare upcoming events, conferences, developments or beta releases … Now, back from holiday we are served with an exciting agenda that suggests that some have been very active for others to enjoy digital currency & technology this starting season. 3 ATMs have been installed on the same day in different locations (L’Hospitalet – Gran Via II, Barcelona – Plaza Catalunya / Triangle and Poble Nou – Pompeu Fabra University). Bitcoin ATMs Exchange & Bitchain operate these machines and do a great job spreading the excellence of bitcoin. From Hong Kong and London Barcelona and its vibrant community Bitcoin have been spotted: Blockchain.Space organized as part of the Blockstrap 2015 @ CREC in Barcelona the first workshop for beginners in Blockchain technology. It was a was full day program and included introductions to Blockchain, transactions, mining, forks, etc. The Barcelona Bitcoin Community (BBC) has launched its own twitter account (https://twitter.com/BTCbarcelona) and web (barcelonabitcoin.org) to enhance the network of supporters and enthusiasts cryptocurrencies. A ‘made in Spain’ ATM has been installed in Athens, Greece. Bitsquare will launch this fall P2P its unique platform for exchange of FIAT/Crypto or Crypto/Crypto. Soon everyone will enjoy this unique concept in the world since it doesn’t force you to register and verify your identity or to use single gateway as other platforms on the market that claim to be P2P. In early September Blockchain Space gives first class hacker the opportunity to participate in the Hackathon Barcelona (last of a European tour). Your code can open the doors to an accelerator program. On September, 28 Blockchain.space announces its Start Up acceleration program in the field of cryptocurrencies. On October, 1 the Barcelona Bitcoin Community will organize the first open day on a Spanish university campus, a prelude to a partnership for the academic year 2015/16, with the University Pompeu Fabra (UPF). UPF wants to use the ATM facility on the campus of Poble Nou to promote reflection and discussion on the ecosystem generated by the bitcoin, combining activities both in technology and in the social economy through law or sociology. In fact, the income generated will go entirely to sponsor R&D activities and projects involving students from different academic degrees. This is a pioneer program in the Spanish universities that seeks to promote knowledge of digital currency and its implications. The Blockchain Week will take place from 5 to 8 October in Barcelona. Conferences around the Blockchain in business. I’m sure this is just the prelude to the explosion in media of everything related to blockchain, digital currencies, network security and other debates that will surely be generated. We will give a new twist to an unstoppable change that will transform many industries in the near future.